How Much Does it Cost to Reface Kitchen Cabinets in 2019? Refacing kitchen cabinets is a different type of process than repainting or refinishing. Refacing is short for resurfacing. During this process, you can add veneers, laminates, drawers, and doors to your current cabinets to create an entirely new look for your kitchen. Only the outer visible portion gets a facelift. You can also change out the cabinet doors during this process to upgrade to a raised panel or flat panel door. The cost to reface kitchen cabinets can vary widely contingent on the material used, labor charges, cabinet units, and hardware. The national average for refaced kitchen cabinets is $3,000. Most will spend between $2,000 and $7,000 for the project, but the costs can rise higher for higher grade wood veneers. The cost of refacing is still considerably less than full replacement. To prepare your cabinets for refacing, take out all the drawers and remove the doors. How much you plan to do will determine if you need to take the cabinets off the wall or not. A good reason to move the cabinets out of your kitchen is to remove the paint or finish and sand the surface to ensure it is clean and smooth to receive the adhesive for the new laminates, veneers, or wood. Use wood filler to fill large holes and cracks. Plus, paint strippers, adhesives, paints, and varnishes can be irritating to the respiratory system. If you hire a contractor or handyman to prepare the cabinets separately from refacing, expect to pay $300 – $500 for this service. Cabinets of poor quality can also be strengthened with a one-quarter inch piece of high-quality plywood before adding a laminate or veneer. Some even use this technique as a low-budget reface with either stain and varnish or superior cabinet paint. This adds some additional cost to the refacing project that varies depending on the condition of the cabinets. Before starting a refacing project it’s important to know what options there are to dress the faces of your cabinets. One of the most inexpensive surfaces to use is a thermofoil laminate. These laminates are generally thought of as “vinyl siding” for kitchen cabinets. They are affordable, but you should consider these temporary, rather than durable. Most contractors will warn against using this material. But, depending on your budget, it is an option that is easy to clean and comes in various colors. 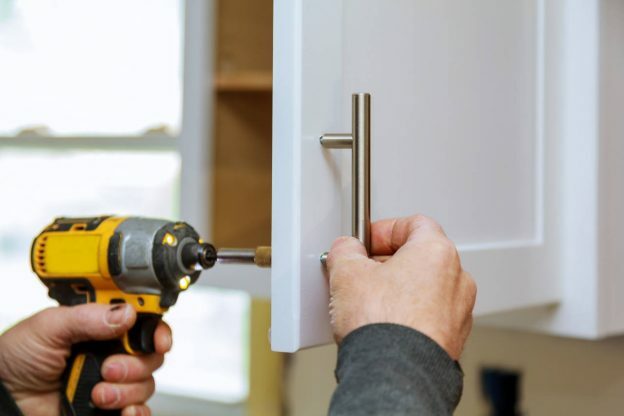 Expect to pay $500 – $1200 to reface cabinets with laminates, depending on the number of units for a DIY, and up to $4,000 for a contractor, or $50 – $65 per linear foot. Cabinets refaced with veneer can get resurfaced for $4,500 to $7,000. Veneers, either with adhesive or without, are around $75 – $100 per linear foot, but these are not suitable for all surfaces. Veneers and laminates placed too close to the stove, or sources of steam and moisture, could reduce their lifespan or cause them to buckle prematurely. Consult a cabinet installer before deciding on either option. High-grade woods such as cherry, mahogany, or walnut will run from $5,000 to $10,000 or more. These woods run $15 – $30 per board foot, while installation will cost $200 – $500 per linear foot. Solid wood is both beautiful and durable, and can be finished with a variety of stains or paints to achieve nearly any look. In some cases, veneered plywood can be used to reduce the cost of hardwoods, which is a balance between a veneered solution and solid wood refacing. This is not always an option and depends on the cabinet style. However, these prices are likely only half what you would pay for replacement custom cabinets, and you can usually get it finished a lot more quickly. If you’re thinking about a DIY project, remember it could take from several days to several weeks, depending on what else you have going on. However, hiring professionals could add a minimum of $200 per linear foot to your project. You can, however, save money by doing some things yourself. Let the contractor know what you would like to do yourself and get it subtracted from their bid. Whatever path you choose, we suggest getting at least three estimates to understand your options and project costs. Enjoy your resurfaced cabinets.